As early as 1923, Georges Riviere related the sitter for Seated Peasant to those men who posed for the series of cardplayers painted by Cézanne beginning about 1890. 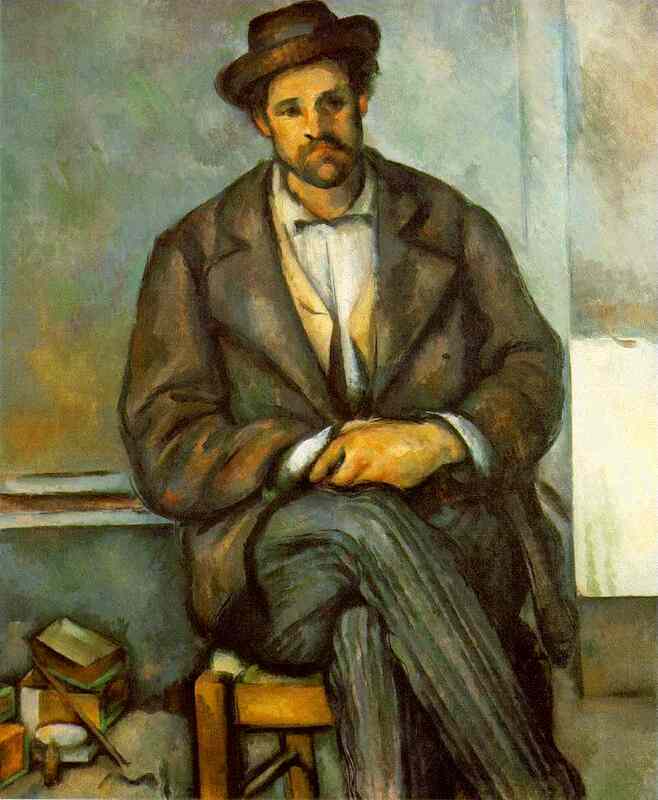 Although this rather melancholy young man who sits stolidly on a simple cane chair cannot be identified as one of the models in any of the five versions of cardplayers, he almost certainly was, like them, one of the farm hands who worked at Cézanne's mother's house, the Jas de Bouffan, near Aix, and to whom Cézanne turned through the 1890s for his figure studies. Some of these figures recur in several paintings and watercolors; others, like this man, appear only once. Most of them were posed in a simple, plastered room, probably in the chateau itself, the only ornament being an applied wooden chair rail. This is a remarkably hermetic picture, smaller than any other of his male studies of this decade and, perhaps because of this, more concentrated and refined in handling. A highly restricted palette of grays, blues, browns, gray greens, and pale yellows is only occasionally relieved with touches of red and purple. The build-up of a lean application is remarkably harmonious and studied. Wetter, attenuated strokes, such as the purple strip on the right knee or the two drips of terre-verte on the whitewashed wall at lower right, seem almost gaily spontaneous in the otherwise stern development of the picture. For so seemingly simple a composition, the spatial illusion is very complex. The room appears to be L-shaped, the wall, with its continuation of the chair rail, projecting into the space to the right of the figure and then turning parallel to the plane of the back wall, banded with a panel of whitewash that is not aligned with the chair rail. The perspective of the chair is directly frontal, receding symmetrically to one vanishing point for both sides of the caned seat and the one rail visible between the man's legs. However, the small perspectival wedge on the right is so surrounded by the ample thigh, the fall of the coattail (which almost but not quite comes into contact with the chair), and the triangle of wall seen beyond the chair that its spatial implications are quite different from those of the more simply constructed section to the left--although this area, too, is made more complicated by the inexplicable white form that appears under the sitter's projecting hip, where the wooden rail must be attached to the caning. The spatial animation of the picture is heightened by the introduction on the lower left of an intricate still life. A group of geometrical objects--two green-bound books, two small boxes, a white square object with a round top, possibly a small bottle, and a stick-- seem to be carefully placed on a heavy cloth, raised (by a crate?) above floor level. Cézanne often introduced still-life elements into his male figure studies--the book-strewn library in which he painted the critic Gustave Geffroy in 1895 being perhaps his most complex perspectival exercise--although never do they play such an independent role as here, as if their introduction were meant almost as some type of spatial subplot. This is truly a case of a figure taking on the aspect of one more still-life element in the composition, very much the "apple" that Cézanne requested Ambroise Vollard to become when he sat for his portrait in 1899. Not only is the painting daunting in a formal sense, but there also remains, as in many of Cézanne's figure studies and portraits of the 18905, a vaguely disturbing irresoluteness in its final psychological expression. Many of the farm hands who posed for Cézanne at the Jas de Bouffan were older men with whom he felt great sympathy and perhaps a degree of identity, admiring their "simplicity and natural dignity." They, like him, had stayed in their native region, rejecting the modern ways of the North. After 1902 these sentiments would culminate in a series of studies of his aged gardener, Vallier, at the studio at Les Lauves, two of which are posed quite similarly to the figure here. However, the Seated Peasant , for all his forbearance, seems lacking, to a degree, in this kind of vivid presence. He is dressed in a jacket and yellow vest (very much like the clothes Cézanne must have worn, as documented by a photograph of the artist taken by K.-X. Roussel in 1906), and with a tightly knotted string tie (also like that described as having been worn by Cézanne). Sullenly he poses for the artist in his slightly oversized coat, his striped trousers loosely fitting his rather stout form. His mouth is drawn down into a habitually natural line, one assumes; his exaggeratedly huge, literally ham-fisted hand comes, because of its disproportionate scale, well out from his chest. His complete frontality--shoulders in an even balance with the folded hands and crossed legs--places him even more monumentally in the space. Here is some type of blunt life force, firmly and irrefutably planted in bovine melancholy. With the exception of identifiable portraits, none of Cézanne's male figure studies of the 1890s, including the cardplayers, can be clearly dated, although this picture has always been placed within the second half of the decade. A "Portrait of a seated man with crossed legs, folded hands, gray background" appears in Vollard's stock books by 1900, although there is no certainty that this is the same picture. By comparison with other works on this scale, Seated Peasant stands well apart from the Standing Peasant , which can be stylistically related quite closely to the cardplayers, and the studies for them from the early years of the decade. In turn, in his painting of a figure of a peasant now in Ottawa --although somewhat larger--with the legs similarly terminated at the ankles, Cézanne pulled the whole figure more tightly to the picture plane. Somewhat less confined and hermetic in its handling and spatial definition, the Ottawa picture of the peasant, justly placed after the turn of the century, contrasts strikingly in his cunning and alert animation to the figure here. A closer comparison can be drawn to the Man with Folded Arms , which appears in two variants although there is an elegance to the lean model who posed for them that is quite distinct from the Annenberg painting. As always in comparing images within any given category of Cézanne's work, one returns to the idea that it is his direct response to the subject--in this case the stolid and beefy young peasant--that dictated the form his picture would take.